This is an old revision of this page, as edited by S.A. Julio (talk | contribs) at 14:13, 19 October 2016 (→‎Current squad: fix close). The present address (URL) is a permanent link to this revision, which may differ significantly from the current revision. An accepted version of this page, accepted on 19 October 2016, was based on this revision. FC Bayern was founded in 1900 by eleven football players led by Franz John. 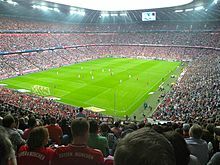 Although Bayern won its first national championship in 1932, the club was not selected for the Bundesliga at its inception in 1963. 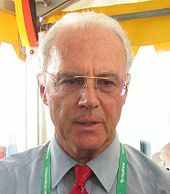 The club had its period of greatest success in the middle of the 1970s when, under the captaincy of Franz Beckenbauer, it won the European Cup three times in a row (1974–76). Overall, Bayern has reached ten European Cup/UEFA Champions League finals, most recently winning their fifth title in 2013 as part of a continental treble. Bayern has also won one UEFA Cup, one European Cup Winners' Cup, one UEFA Super Cup, one FIFA Club World Cup and two Intercontinental Cups, making it one of the most successful European clubs internationally. Since the formation of the Bundesliga, Bayern has been the dominant club in German football with 26 titles and has won 8 of the last 12 titles. 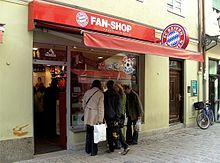 They have traditional local rivalries with TSV 1860 München and 1. FC Nürnberg, as well as with Borussia Dortmund since the mid 1990s. For the 1972 Summer Olympics the city of Munich built the Olympiastadion. The stadium, renowned for its architecture, was inaugurated in the last Bundesliga match of the 1971–72 season. The match drew a capacity crowd of 79,000, a total which was reached again on numerous occasions. The stadium was, in its early days, considered to be one of the foremost stadia in the world and played host to numerous major finals, such as that of 1974 FIFA World Cup. In the following years the stadium underwent several modifications, such as an increase in seating space from approximately 50% to ca. 66%[clarification needed]. Eventually the stadium had a capacity of 63,000 for national matches, and 59,000 for international occasions such as European Cup competitions. Many people, however, began to feel that the stadium was too cold in winter, with half the audience exposed to the weather due to lack of cover. A further complaint was the distance between the spectators and the pitch, the stadium betraying its track and field heritage. 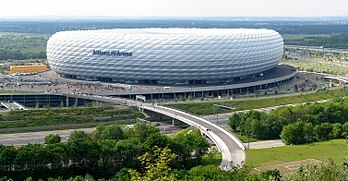 Modification of the stadium proved impossible as the architect Günther Behnisch vetoed major modifications of the stadium. The three consecutive Champions League trophies won by FC Bayern Munich from 1974–76. The one on the far right is the real trophy, given to Bayern permanently. The ones on the left are slightly smaller replicas. The present manager, since July 2016, is Carlo Ancelotti, Real Madrid's former coach. On 20 December of 2015, the club announced that Guardiola would not extend his contract beyond the end of the 2015–16 season. 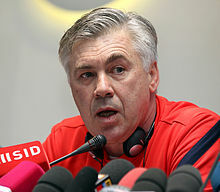 Carlo Ancelotti would be presented as his successor. ^ "Bayern München". FIFA. Retrieved 10 May 2012. ^ "Die Mitglieder-Entwicklung des FC Bayern München" (PDF) (in German). FC Bayern Munich. 27 November 2015. Retrieved 4 January 2016. ^ "CLUB WORLD RANKING 2015". IFFHS. 7 January 2016. Retrieved 23 September 2016. ^ "CL Comment: Van Gaal's Bayern Give New Meaning to "FC Hollywood"". Goal.com. 8 April 2010. Retrieved 9 June 2013. ^ "Bayern and Chelsea renew rivalry". UEFA,com. 20 May 2012. Retrieved 20 May 2012. ^ "Bayern Munich 0-0 Borussia Dortmund". BBC. 21 May 2016. ^ "Bayern Munich confirm Carlo Ancelotti will replace Pep Guardiola". SkySports. 20 December 2015. ^ "'Der FC Bayern ist eine Oase der Ruhe'" (in German). FC Bayern Munich. 16 November 2012. Retrieved 17 August 2015. ^ a b c d e f g "Company". FC Bayern Munich. Archived from the original on 26 September 2015. Retrieved 26 November 2015. ^ "'Mr Consistency'". FC Bayern Munich Official Website. Archived from the original on 5 May 2009. Retrieved 28 May 2013. ^ Dan Bigman (19 April 2012). "The World's Most Valuable Soccer Teams". Forbes. Retrieved 30 January 2012. ^ "German Super Cup 1982". ^ Ludolf Hyll (1988). Süddeutschlands Fussballgeschichte in Tabellenform 1897–1988 [Southern Germany's football history in tables] (in German). 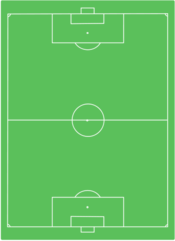 ^ "FC Bayern München – First Team". fcbayern.de. 2015. Retrieved 8 June 2015. ^ "FC Bayern München – Squad". bundesliga.com. 2015. Retrieved 11 November 2015. ^ "FC-Bayern greift durch: Youngster-Trio muss wieder zu den Amateuren – FC Bayern – Abendzeitung München". abendzeitung-muenchen.de. 20 August 2015. ^ "Hall of Fame" (in German). The official FC Bayern Munich Website. 2012. Retrieved 28 August 2014. ^ "First team squad 2016/2017". fcbayern.de. 2016. Retrieved 3 July 2016.